While many of us wait for the release of God of War III next year, we'll have something to hold us over when the God of War Collection launches on November 17th. 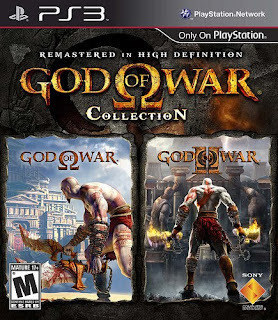 The God of War Collection is a PS3 format game that includes the original God of War and God of War II, both remastered in full HD. So here's a couple of cool things about this. One, you get to play (either again or for the first time) the previous God of War games in high definition glory. Can you visualize how sweet that would be? And two, there's full trophy support for both games. In fact, the God of War team had some fun with this and created some interesting trophies. An example is the "Speed of Jason McDonald" gold trophy achievable in God of War. Jason is the Sr. Combat Designer for God of War III and holds the office record for the best speed run for God of War. To order to gain the "Speed of Jason McDonald" trophy, you'll need to complete the game in under 5 hours. For the complete list of trophies for both games, have a look below. Beat it today in just under the 3 hour mark. Probably could have shaved a little off that but hey, got the trophy so i'm happy!